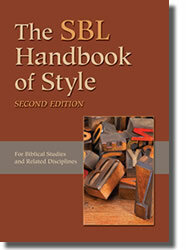 The new edition of the Chicago Manual of Style has changed its recommendations regarding the use of ibid. in bibliographic citations. As the 17th edition states: In a departure from previous editions, Chicago discourages the use of ibid. in favor of shortened citations as described elsewhere in this section; to avoid repetition, the title of … Continue reading CMS Update: Ibid.